Confused and conflicted about which “diet” you should follow? Traditional Food or Paleo or Real Food… AIP, SCD, GAPS… ?? With all the labels and styles of healthy diets, it's no wonder we're a bit befuddled. There's an easy answer… and it requires no label, no “diet”. It's just plain and simple common sense — focus on healthy, nutrient-dense foods! What are these foods? In my opinion, there are 5 healthy, nutrient dense foods everyone should be eating. 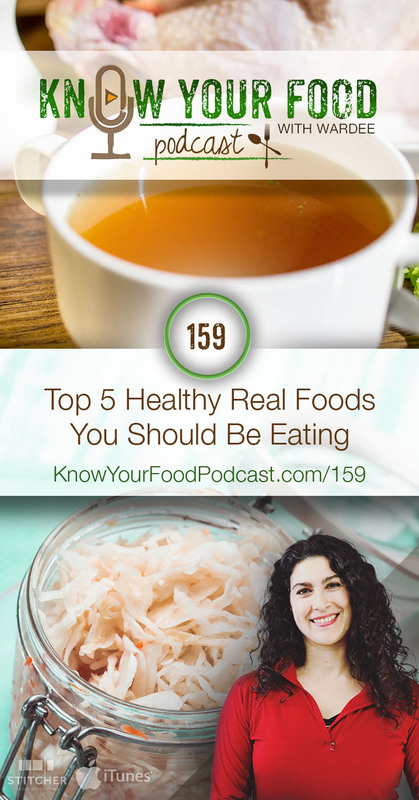 You'll see podcast and video detailing these top 5 healthy foods below. And you can get the full notes here. Besides detailing the 5 foods in the podcast and video above, the full notes are here. Remember, go here to read the full transcript! Excellent list. In August after stopping chemo for 1 year still felt weak. Decided diet was key. Started focusing on eating more whole food and reducing processed food. What a difference it made in how I felt and in my blood numbers. I will pass your list onto chemo patients. I’ve started focusing on all of these but did not know about green smoothie problems! Thanks for the great info. Also raw unfiltered honey & apple cider vinegar! My grandmother (born in 1898) cooked this way and she had 3 heart attacks and was overweight and STILL lived to 72 which was a good age for that generation.